But what is extraordinary, and absolutely needs to be underlined in Tsipras’s case, is that a few days after he was elected in January 2015 and formed his government, before he had taken any measures whatsoever, on 4 February the ECB cut off the normal flow of cash to Greece’s banks (see this and this). When we think of “economic collapse” our imaginations usually lead us immediately to the desperation we’ve witnessed in places like Venezuela or Greece. We think of starvation, a complete lack of medical care, and waves of suicide by people who simply can’t survive. We imagine an apocalyptic societal breakdown that is immediately visible. Here in America, I suspect the collapse is going to look a lot different than it has in these other countries…at least, at first. And in my description, it’s entirely likely you’ll see that many of these signs have been happening all around us for years. The thing with collapses that we see in the media is that we are seeing the end results of events that have been slowly declining for years. Venezuela was one of the wealthiest countries in the world back until the mid-1980s, due to their rich oil reserves. Then oil prices collapsed and their fall began. It was actually several decades though before it was truly evident that the country was in trouble. Preparedness bloggers here have been sounding the warning bell since 2008 (at least) when our economy went into a recession. While the US managed to dig its way out of that to at least an illusion of renewed prosperity, it’s questionable how much of that return was real and how much of it was propaganda. Well so much for New Year cheer. With this one tweet, the EU put 2019 on track to be even worse than 2018. 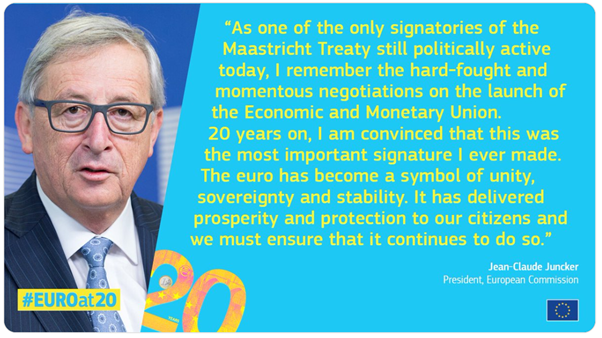 Using anyof those words to describe the Euro—apart perhaps from “unity”, since the same currency is used across most of continental Europe now—is a travesty of fact that even Donald Trump might baulk at. 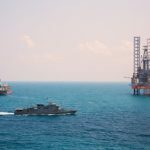 Things have been quite active in the Eastern Mediterranean lately, with Israel, Cyprus and Greece pushing forward for the realization of the EastMed pipeline, a new gas conduit destined to diversify Europe’s natural gas sources and find a long-term reliable market outlet for all the recent Mediterranean gas discoveries. The three sides have reached an agreement in late November (roughly a year after signing the MoU) to lay the pipeline, the estimated cost of which hovers around $7 billion (roughly the same as rival TurkStream’s construction cost). Yet behind the brave facade, it is still very early to talk about EastMed as a viable and profitable project as it faces an uphill battle with traditionally difficult Levantine geopolitics, as well as field geology. The EastMed gas pipeline is expected to start some 170 kilometers off the southern coast of Cyprus and reach Otranto on the Puglian coast of Italy via the island of Crete and the Greek mainland. Since most of its subsea section is projected to be laid at depths of 3-3.5 kilometer, in case it is built it would become the deepest subsea gas pipeline, most probably the longest, too, with an estimated length of 1900km. The countries involved proceed from the premise that the pipeline’s throughput capacity would be 20 BCM per year (706 BCf), although previous estimates were within the 12-16 BCm per year interval. According to Yuval Steinitz, the Israeli Energy Minister, the stakeholders would need a year to iron out all the remaining administrative issues and 4-5 years to build the pipeline, meaning it could come onstream not before 2025. 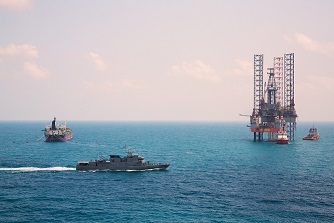 The idea of EastMed was first flaunted around 2009-2010 as the first more or less substantial gas discovery in the Eastern Mediterranean, the Tamar gas field in Israel’s offshore zone, paved the way for speculations about an impending gas boom. The concept of the EU might have worked, but still only might have, if a neverending economic boom could have been manufactured to guide it on its way. But there was never going to be such a boom. Or perhaps if the spoils that were available in boom times and bust had been spread out among nations rich and poor and citizens rich and poor a little more equally, that concept might still have carried the days. Then again, its demise was obvious from well before the Union was ever signed into existence, in the philosophies, deliberations and meetings that paved its way in the era after a second world war in two score years fought largely on the European continent. In hindsight, it is hard to comprehend how it’s possible that those who met and deliberated to found the Union, in and of itself a beneficial task at least on the surface in the wake of the blood of so many millions shed, were not wiser, smarter, less greedy, less driven by sociopath design and methods. It was never the goal that missed its own target or went awry, it was the execution. Still, no matter how much we may dream, how much some of the well-meaning ‘founding fathers’ of the Union may have dreamt, without that everlasting economic boom it never stood a chance. The Union was only ever going to be tolerated, accepted, embraced by its citizens if they could feel and see tangible benefits in their daily lives of surrendering parts of their own decision making powers, and the sovereignty of their nations. The word contagion is easy enough to understand. Whether the spread of disease or disaster, sometimes it is difficult if not impossible to contain. In financial terms, contagion is often thought of along the lines of 2011; Greece started it and it spread throughout the rest of Southern Europe. 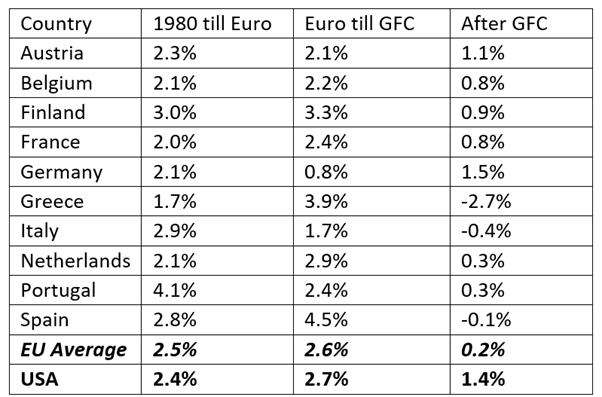 The euro was coming apart, and what “it” was didn’t seem to matter. The eurodollar system is not a single, monolithic whole. It features many different pieces that sometimes don’t fit together at all. There is always something wrong somewhere, even during the best of times. It is eerie in hindsight, but there was a huge outbreak of repo fails, for example, in 2001 following September 11th. It kept up for months on end, until the middle of 2002. Outside of dot-com stocks, the system didn’t crash. Quite the contrary, while the repo market was awash in trouble the recession which had begun months before ended. Economic recovery, though tepid and shameful, emerged out of those difficulties which were at times quite severe (there were more than $1 trillion in fails the week of February 13, 2002). The dollar, in fact, would start to fall and keep on falling consistent with rapid, massive eurodollar system growth and inflation. Contagion is where funding issues in one part of the system spillover into another; and then another. Rather than operate like a seamless global money system, the parts break down and not always one by one. Parabolic contagion, which is what September 2008 really was, can be lurking. The effects are not always financial and economic. Two examples from this weekend remind us of this fact. Both the parties in German Chancellor Angela Merkel’s governing coalition have suffered heavy losses in a regional election, early results show. The Middle East has a century old tradition of being the political graveyard of American and British political leaders. The list of casualties is long: Lloyd George, Anthony Eden, Jimmy Carter, Ronald Reagan, Tony Blair and George W Bush. All saw their careers ended or their authority crippled by failure in the region. Will the same thing happen to Donald Trump as he struggles with the consequences of the alleged murder of Jamal Khashoggi? I always suspected that Trump might come unstuck because of his exaggerated reliance on a weak state like Saudi Arabia rather than because of his supposed links to Russia and Vladimir Putin. Contrary to the PR company boosterism of Crown Prince Mohammed bin Salman (MBS) and his ambitious projects, Saudi Arabia has oil and money, but is demonstrably ineffective as an independent operator. The Middle East disasters that toppled so many Western leaders have a certain amount in common. In all cases, the strength of enemies and the feebleness of friends was miscalculated. Lloyd George was forced to resign as prime minister in 1922 because he encouraged the doomed Greek invasion of Anatolia which almost led to a renewed Turkish-British war. George W Bush and Tony Blair never understood that the occupation of Iraq by American and British ground forces had no support inside Iraq or among its neighbours and was therefore bound to fail. A British military intelligence officer stationed in Basra told me that he could not persuade his superiors of the potentially disastrous fact that “we have no real allies anywhere in Iraq”. QUESTION: Mr. Armstrong; You mentioned that the environment was the primary cause of the Greek Dark age between the Heroic and Hellenistic periods. Can you elaborate on that at all? ANSWER: What is most interesting is the fact that they do not connect the dots which are so glaring for that period of time. The Bronze Age Collapse was a Dark-Age in the Near East, Asia Minor, Aegean region, North Africa, Caucasus, Balkans and the Eastern Mediterranean. This encapsulated the transition from the Late Bronze Age to the Early Iron Age, which was violent, sudden, and a major setback for civilization as a whole. 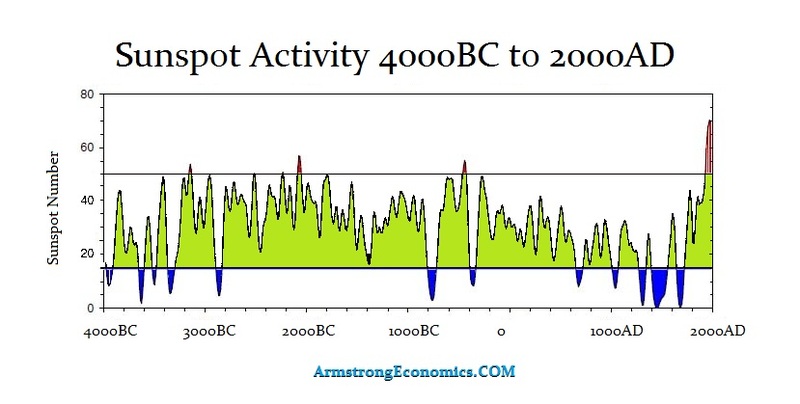 We seem to focus on the fall of Rome, but not the catastrophic collapse of the Bronze Age. The political economy of city-states that dominated the Aegean region and Anatolia region (Modern Turkey), simply disintegrated much like Rome whereby people abandoned cities and formed small isolated village during the Greek Dark Age. 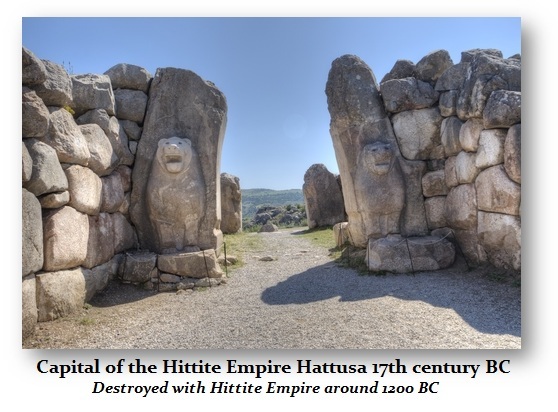 This takes place about 51.6 years following the cultural collapse of the Mycenaean kingdoms, of the Kassite dynasty of Babylonia, of the Hittite Empire in Anatolia and the Levant, and of the Egyptian Empire. We also see the political-economic destruction of Ugarit and the Amorite states in the Levant. Over in the Luwian states of western Asia Minor, we also see a collapse in civilization. There was also a period of tremendous political-economic chaos in Canaan (Israel). This wholesale collapse of all of these city-states resulted in the collapse of trade routes as we saw with the collapse of Rome. This also manifests in the reduction of literacy in much of the known world. A serious showdown is brewing in the Eurozone as Italy’s anti-establishment coalition government takes on the EU establishment in a struggle that could have major ramifications for Europe’s monetary union. The cause of the discord is the Italian government’s plan to expand Italy’s budget for 2019, in contravention of previous budget agreements with Brussels. The government has set a public deficit target for next year of 2.4% of GDP, three times higher than the previous government’s pledge. It’s a big ask for a country that already boasts a debt-to-GDP ratio of 131%, the second highest in Europe behind Greece. To justify its ambitious “anti-poverty” spending plans, proposed tax cuts, and pension reforms, the government claims that Italy’s economic growth will outperform EU forecasts. On Wednesday ECB President Mario Draghi held a private meeting with Italian President Sergio Mattarella in Rome, at which he reportedly raised concerns about Italy’s public finances, the upcoming budget bill, and related stock-exchange and bond-market turbulence. The meeting evoked memories of the backroom machinations that Draghi, together with his predecessor, Jean Claude Trichet, undertook to engineer the downfall of Italian premier Silvio Berlusconi in 2011 and his replacement with technocrat Mario Monte, after Berlusconi had posited pulling Italy out of the euro during Europe’s sovereign debt crisis. In retrospect that may have been premature, because as Bloomberg reports, over 8 years after its first bailout Greece is finally considering a plan to help its banks become viable, and speed up their bad-loan disposals in a bid to restore confidence in the crushed sector. At its core, the Greek plan is the now familiar “bad bank” structure, in which banks get to spin off their NPLs into a separate, government-guaranteed SPV (although in the case of Greece, it is not clear if a government guarantee is all that valuable). The SPV would then be funded by selling bonds to the market. While the details are still being worked out, an asset protection plan would see lenders unload some bad loans into special purpose vehicles, taking them off banks’ balance sheets. The SPVs would issue bonds, some guaranteed by the state, and sell them to investors, the people said, asking not to be named as the information isn’t public. The move came after a furious selloff in Greek stocks, and especially banks, which was the culmination of a YTD plunge which has seen Greek banks lose more than 40% this year amid doubts they can clean up their balance sheets fast enough. The banks, which amusingly all cleared the ECB’s stress test earlier this year despite being saddled with tens of billions of NPLs, have been under mounting pressure from supervisors to cut their bad-debt holdings. According to Bloomberg, the plan appears to have been borrowed from Italy, which conducted a similar exercise to stabilize its own banking sector. The political and media coverup of the genocide of the Greek Nation began yesterday (August 20) with European Union and other political statements announcing that the Greek Crisis is over. What they mean is that Greece is over, dead, and done with. It has been exploited to the limit, and the carcas has been thrown to the dogs. 350,000 Greeks, mainly the young and professionals, have fled dead Greece. The birth rate is far below the rate necessary to sustain the remaining population. The austerity imposed on the Greek people by the EU, the IMF, and the Greek government has resulted in the contraction of the Greek economy by 25%. 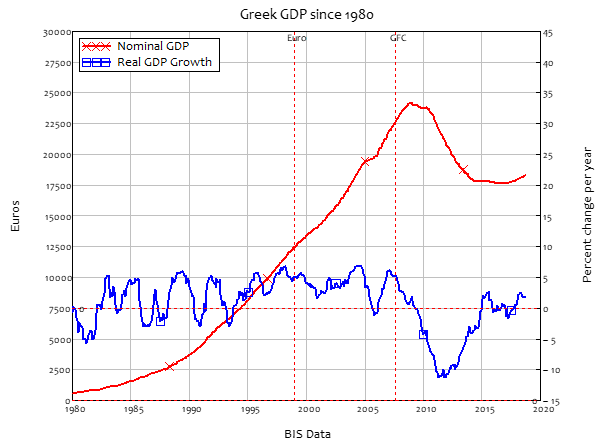 The decline is the equivalent of America’s Great Depression, but in Greece the effects were worst. President Franklin D. Roosevelt softened the impact of massive unemployment with the Social Security Act other elements of a social safety net such as deposit insurance, and public works programs, whereas the Greek government following the orders from the IMF and EU worsened the impact of massive unemployment by stripping away the social safety net. Traditionally, when a sovereign country, whether by corruption, mismanagement, bad luck, or unexpected events, found itself unable to repay its debts, the country’s creditors wrote down the debts to the level that the indebted country could service. With Greece there was a game change. The European Central Bank, led by Jean-Claude Trichet, and the International Monetary Fund ruled that Greece had to pay the full amount of interest and principal on its government bonds held by German, Dutch, French, and Italian banks. How was this to be achieved? In two ways, both of which greatly worsened the crisis, leaving Greece today in a far worst position that it was in at the beginning of the crisis almost a decade ago. The Turkish courts of the time saw this as “an incitement to violence and religious or racial hatred..” and sentenced him to ten months in prison (of which he served four in 1999). The courts saw Erdogan as a threat to the secular Turkish state as defined by Kemal Ataturk, the founder of modern Turkey in the 1920’s. Erdogan is trying to both turn the nation towards Islam and at the same time not appearing to insult Ataturk. The reality is that many Turks today lean towards a religion-based society, and no longer understand why Ataturk insisted on a secular(ist) state. Which he did after many years of wars and conflicts as a result of religious -and other- struggles. Seeing how Turkey lies in the middle between Christian Europe and the Muslim world, it is not difficult to fathom why the ‘father’ of the country saw secularism as the best if not only option. But that was 90 years ago. And it doesn’t serve Erdogan’s purposes. If he can appeal to the ‘silent’ religious crowd and gather their support, he has the power. To wit. In 2003, one of his first acts as prime minister was to have Turkey enter George W.’s coalition of the willing to invade Saddam Hussein’s Iraq. As a reward for that, negotiations for Turkey to join the EU started. These are officially still happening, but unofficially they’re dead. As KeepTalkingGreece.com reports, in a post on their Facebook page, Anonymous Greece sent their own message to the disaster. Expressing condolences for the victims, the group blamed the government for the unfair death of more than 90 people. “Responsibility lies on the government that remained idle at the time of disaster and did not inform the citizens letting them burn alive,” the group argued. “It is obvious that nobody would have died had the state reacted in time. People didn’t know the fire was approaching and we came to the point to mourn more than 90 dead families and children,” the message read. The group claimed that “that was the goal” of the government. “Dear Church, instead of offering help to the fire-stricken people you started accusing the citizens. ‘They were burned because of their sins’. What sins did the twin angels have?” the group notes with reference to the 9-year-old twin girls who died in the fires. “Close to God is someone who offers to his fellow man and helps as much as possible for a better world. Who loves and offers support. You are just pawns of the state, “the group concluded its message. The message was uploaded on Sunday evening, the government website was down on Monday afternoon. The group page on Facebook has been closed down, notes newsit. What happened in Attica, close to Athens, is without precedent. An ordinary fire, like the ones that occur in this area almost every other summer, met up with a terrible, sudden wind that turned it into real galloping inferno. The tragic result was 87 dead Greek citizens and more than 20 still missing. Huge questions loom on the horizon and only very limited answers are forthcoming. Are some of the lessons from this tragedy related to the wider geopolitical and political-economic questions? Why do tragedies like these occur in social environments with firmly entrenched clientelist political systems and in political entities that operate on the periphery of major, bureaucratic, modern empires? Sweden saw huge uncontrolled fires this summer. However, there was no loss of life or major disasters that befell the urban centers. In Portugal last year — and very recently in Greece — scores of people died, mainly due to the inability of the state machinery to efficiently deal with the problem. The major difference between these examples is the quality of the civil service. In Greece and Portugal there is no real ethics in the public administration, which frequently fails to meet any vigorous efficiency test . In public bureaucracies that sprout favoritism the way trees grow branches, it is very difficult to design long-term plans to handle critical and life-threatening situations. Likewise, the political system lacks the prerequisites to draw upon informed societies that are trained to be cooperative and disciplined when there is a need for coordination. When clientelism dictates and forms the essence of the political culture, this culminates in fractured societies that are infected with spreading islands of lawlessness and limited possibilities for administrative coherence.